A certain amount of green algae growth in an aquarium is inevitable. All the elements are there for it: nutrients, water and light. While algae is not necessarily a bad thing, it is unsightly and difficult to eliminate completely. This can be frustrating for aquarists, particularly novices. 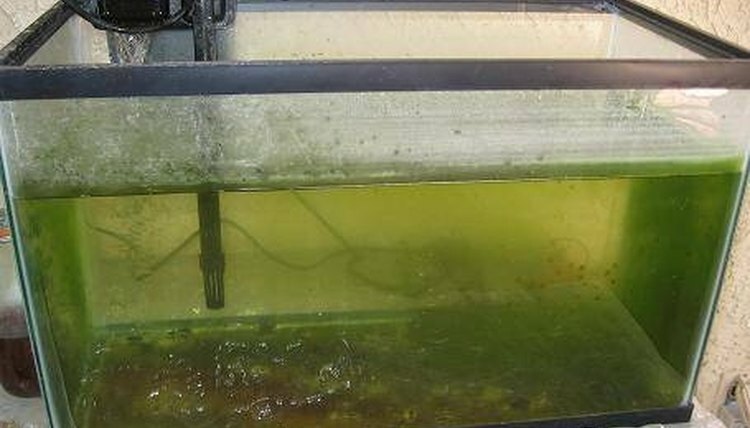 The completely removing all green algae from a fish tank is an unreachable goal and is unhealthy for your fish. Green algae can be removed from glass, however, and subsequent growth can be kept to a minimum by following these guidelines. Scrape green algae growth that is already present off the glass. Use an aquarium scraper or sponge, a squeegee, or the edge of a razor blade. If you have an acrylic tank, be sure to use a sponge that is designed for safe use on acrylic, otherwise you will scratch your tank. Remove subsequent growth, if there is any, as soon as it appears. Add some algae-eating fish, such as mollies, Amano shrimp, nerite snails or sucker-mouth catfish. Remember, though, when you add more fish to your tank you are increasing the tank's bio load. More fish will produce more nitrates and phosphates. This will increase the growth rate of green algae. Algae eaters are only part of the plan; they are not The Plan. Change the tank's water frequently to reduce available nutrient levels. Once a week, scoop out approximately ¼ of the water in the tank and fill it with new. Replacing the water keeps the nitrates and phosphates produced by your fish at lower levels. These waste products are the main nutrients utilized by green algae. Less nutrients means less growth. Add live plants to the tank. Aquatic plants such as vallisneria, hygrophila and cabomba will outcompete algae for available resources. These plants grow very rapidly under the same conditions as green algae and likely will need weekly pruning once they become established. Adjust the aquarium lighting. Do not leave the aquarium light on for more than 10 to 12 hours a day. Try to break up the lighting period, lby eaving the lights off for two hours in the middle of the day. The plants and the fish will do just as well, but green algae growth will be inhibited. This type of lighting scheme can be achieved by using a light timer. Also, move the tank out of the direct sunlight. Slow-growing aquatic plants, such as java ferns, have no effect on the growth of green algae, and in fact, can be smothered by algae growth. Make sure you choose fast-growing plants.